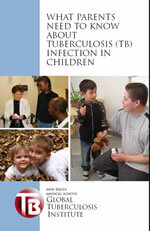 This brochure provides parents with important information on tuberculosis infection in children. It is designed in a question and answer format with highlighted information for quick and easy readability. The information covered ranges from the definitions of tuberculosis (TB) infection and TB disease to diagnosis and treatment of TB infection. In addition, tips on treatment improving adherence are provided to ensure completion. The brochure can be distributed to parents of children with latent tuberculosis infection and can also used by health care providers when providing education on LTBI to parents. This product is intended to be downloaded, printed and distributed at health department clinics or other locations where treatment of children with LTBI is provided. For technical assistance with this product, please contact Anita Khilall at anita.khilall@rutgers.edu or at (973) 972-9102.